How you talk about your divorce matters. It shapes how you see it internally, and react to it. It affects how you see yourself, and how others see you. So, how do you see your divorce? How do you describe it to other people? When my husband first left, I felt that getting divorced was the worst thing that had ever happened to me. I talked to my friends about how difficult it was, how unfair it was, how I was struggling, how impossible I found it all, how angry I felt. Does that sound familiar? Telling my story this way meant that I was caught in a negative thought pattern. I was casting myself as the victim of a divorce that was happening to me. This just increased my feeling of not being in control. I was looking backwards, trying to work out what went wrong, and not coming up with any answers. It was no wonder I felt low and down! My friends kept telling me that I was managing pretty darn well. I didn’t believe them at first, but they were right. I was coping with two small children, and a job in a City law firm. I was holding it together, and I was doing things I had never done before, like mow the lawn and fix the car, on top of all the things I had always done. I started to realise that, rather than looking at how I was struggling, I could notice where I was succeeding. When I felt down, I could ask myself whether there was anything I could do to help myself feel better. I saw that I could be kind to myself, and support myself by telling my story differently, with self-compassion and positivity. I could talk to myself as I would to my best friend. Rather than my divorce simply happening to me, with me as its victim, I could rewrite the ending. I could be the heroine of my own story. Once I started telling my story differently, highlighting all the things I was doing well, I was amazed at how quickly my feelings changed. I began to feel more positive, and to believe in myself. If I can do this, you can do it too. 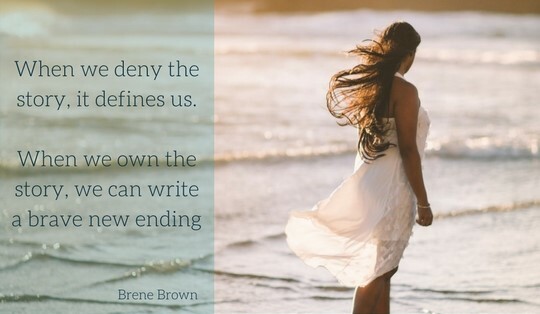 You can be the author of your own divorce story, with your own happy ending. Instead of telling a sad story with you as the victim, you can reframe and retell your story, so that you emphasize your strengths, and focus on the positive. Think about how you are telling your story right now. What language do you use when you talk about your divorce? What words do you use to describe what is happening? You could write it down if that helps. Think about how the story you tell makes you feel. Are you using words that make you feel better? Are you highlighting the things you are doing well? Or are you using words that drag you down? Consider how you could retell your story to spin it around. Think about your situation – have you learnt how to do anything new since your separation? Do you have more freedom of choice in some areas? For example, I no longer had to check with my husband’s schedule if I wanted to go out, or meet up with a friend. I could book a babysitter and go out if I chose. Or I could sit and watch trashy TV in my pyjamas if I chose. Reframe your story, to emphasize the positives, and the strength that I know you are showing. Try telling someone your newly framed story, and see how they respond. Is their reaction different now? Do YOU feel different now? Once you start to focus on the positives in your story, so will others around you, and your conversations will become more positive, more hopeful, and more empowering for you. Concentrating on the positive feels good, and you’ll find yourself wanting more.